This is a test posting to the posterous blog using the online web form as the editor. I’m including a picture which I’m uploading, along with the audio file. Once I’ve posted from all three sources I’ll look at the page code and see if I can determine whether any one source produces more accessible code. This is a test posting to the posterous blog using apple MAIL as the editor. I’m including a picture, which I’ve dragged into the body of the email. I’m also attaching an audio file as an attachment. Once I’ve posted from three different sources I’ll look at the page code. This is a test posting to the posterous blog using Outlook as the editor. I’m including a picture, which I’ve attached, as Outlook doesn’t seem to want me to drag the image into the body of the email. Once I’ve posted from three different sources, I’ll look at the page code. One of the comments that struck me from the screen reader review of this site that @ahiggi carried out, was that two similar components on the page showed different behaviour. In the case of the review there were two Audioboo objects. One of the most useful things about posterous, is that posts to the blog really ARE posts. You compose an email, send it to post@posterous.com, and it does the rest… There’s also a web interface where posts can be composed, in either a rich text editor (like this post), OR as html. 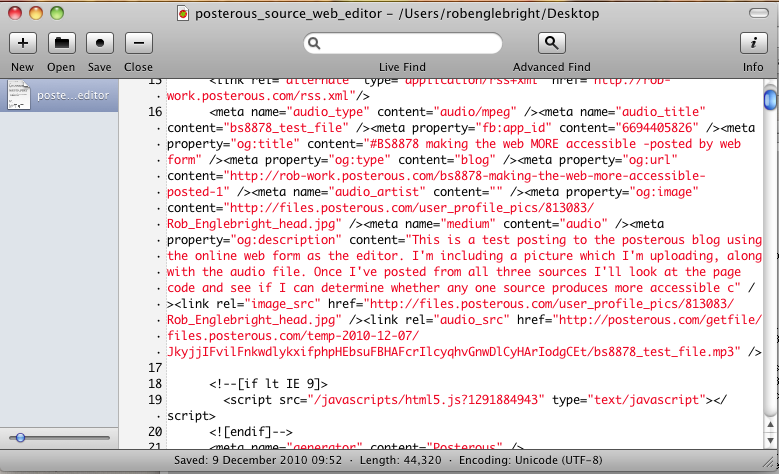 So on posts where you include some embed code, you might want to drop the code into the page where it’s needed. I thought I’d create a simple post, with a bit of text, an image and maybe an audioboo object and see how the code looks when the posts are generated through a number of different editors. December 3rd is the United Nations International Day of Persons with Disabilities. http://www.un.org/disabilities/default.asp?id=1540 and it’s a good starting point for a review of web accessibility.Next week I’m going to be looking in detail at the new standard from BSI, BS8878, which updates PAS78: Good Practice Guide in Commissioning Accessible websites. It covers the process of making web products accessible, rather than getting hung up on technical issues which are dealt with fully elsewhere. There are a number of events throughout next week around the launch, including a free morning event in London on the 7th, with Jonathan Hassell who chaired the BSI IST45 committee. The London event is now full, but there may be space at the free webinar from AbilityNet <a href="https://www1.gotomeeting.com/register/763164576. https://www1.gotomeeting.com/register/763164576.<br /> Follow the action using twitter hashtag #BS8878.